The Rudolf Nureyev Look. The look can be played down to create a formal, sophisticated image, or embellished to create a rock edge, a physicality and attitude, a look that echoes Nureyev’s characteristics. Russian ballet dancer Rudolf Nureyev was born in the former Soviet Union in 1938. It was a Russia of KGB secret police and subterfuge. It was a nation in direct contrast to Nureyev himself. It was a world that the rebellious, outspoken Nureyev would outgrow; a bubble that he could burst. He fell in love with ballet from an early age after his mother had smuggled him into a performance and by the age of 17, he had left home to attend ballet school in Leningrad. Nureyev gained country wide recognition through his hard work and he became a sensation by the 1950s. The video below shows some of his performances, clearly explaining why this man became such a star amongst his audience. His rebellious character meant that the Soviet government would not allow Nureyev to go on a European ballet tour, a tour that the Soviets needed to go according to plan. However in 1961 due to an injury to the lead dancer, Nureyev was permitted leave where he immediately ruffled the government, as he began speaking to foreigners, subsequently breaking the Soviet rules. The KGB tried to coax him back, saying he was needed at a special performance in Russia, and when that failed, that his mother had taken ill. Knowing these were lies and that returning to his homeland would result in imprisonment, Nureyev defected from the Soviet Union, immediately becoming of worldwide interest. The Soviet government would not allow him back in the country until 1987. The collection looks at Nureyev’s Russian roots, his ballet wear and his personal style. The collection contains many fitted pieces mixed with flamboyant and colourful neck wear – a staple of Nureyev’s wardrobe. The Nureyev look is a dishevelled elegance, a modern romantic. The look can be played down to create a formal, sophisticated image, or embellished to create a rock edge, a physicality and attitude, a look that echoes Nureyev’s characteristics. Years after his death to AIDS in 1993, Nureyev still inspires people today. On a fashion front, Nureyev was John Galliano’s muse for his A/W 2011-12 collection. 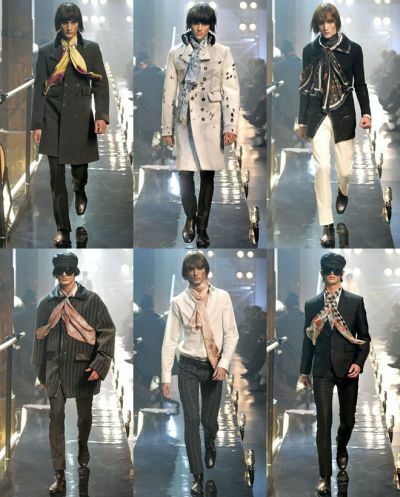 Reminiscing the Chelsea boot clad Beetles, this look [2nd John Galliano bottom right] showcases the formality of a two-piece suit muddied by rock and roll through the inclusion of accessories and attitude. 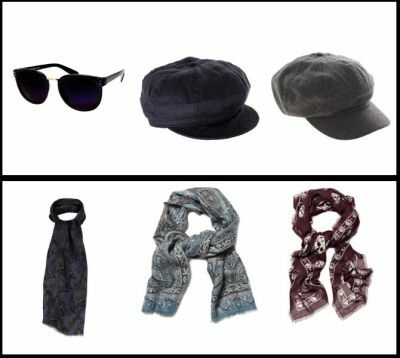 It’s a look Nureyev triumphed through the inclusion of hats (which he collected) and/or bold sunglasses. An open shirt really breaks the formality to reveal some rock, as does the inclusion of rings or other male jewellery. 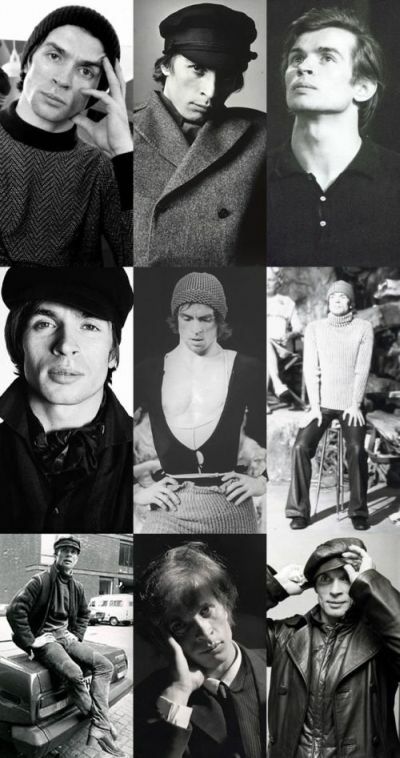 When he wasn’t being a flouncing dandy, Nureyev was wearing his second favourite wardrobe item (after his hats); a turtleneck [Rudolph Nureyev look book bottom left]. Not going out of fashion any time soon, this versatile piece can easily be dressed up under a shirt and jacket or down under some hardy leather. It is the number one piece in the sartorial alpha male wardrobe (Michael Fassbender is also doing it here: X-Men: Looking First Class) and will continue to be a timeless look for years. I cannot think of many people more deserving of being called an icon than Rudolf Nureyev. He was a man of great ability of both character and skill, but also of great humility. He is an icon for self-belief and determination, aspects we can all try and emulate. However if there is something we can learn immediately from Nureyev, it’s that you can’t have too many hats.